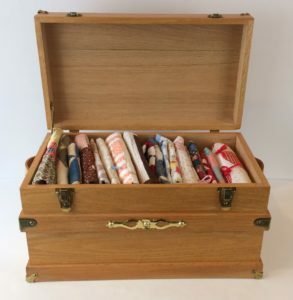 In the early 1990s my dad (who was a wood craftsman on the weekends) made this adorable little Trunk for my mom, so she could keep some doll quilts in it. 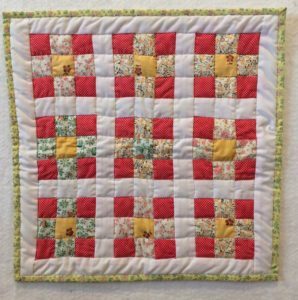 You can see that it is filled with 20 treasured little quilts. I will share several of them with you today. I hope it inspires you to make a little quilt of your own. The first one is red and white and made with eyelet fabric as well as a sweet eyelet edging. The polyester batting must be 2” thick! That is probably why she tied it with red yarn bows. 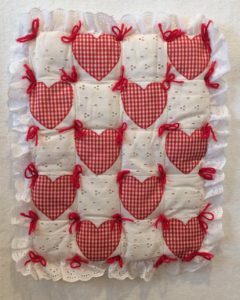 The hearts are zig zagged onto white muslin but when it all comes together it makes a precious Valentine doll quilt (16” x 20”). The next one is made from 9-patch blocks that I believe came from grandma or great grandma’s scrap bag. They look like feedsack fabrics and I think my mom found them and set them in plain white fabric and added a nice yellow calico binding. It is machine stitched and measures 13.5” x 13.5”. 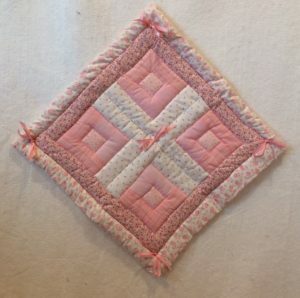 I think 9-patch blocks must have been her favorite because here is another one, set in pastel pink. It only measures 8” x 8” but it is precious little fabrics. She used to keep it under an antique kerosene lamp on a little table in her “pink” bathroom. It went with this next quilt which hung on the wall. She pinned it from one corner, so it looked like a pink diamond with log cabin blocks. It also has the 2” polyester batting so she tied it with pink ribbon bows and machine quilted just a little. 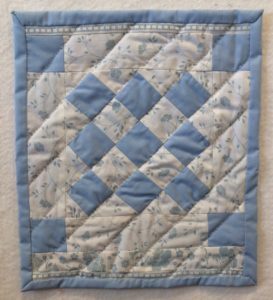 The last little blue and white quilt (10” x 11.5”) was made from leftover sheets that were wearing out, but she salvaged the good portions of fabric and made this little doll quilt. 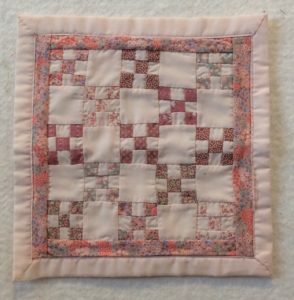 It is hand quilted in diagonal lines and the backing is folded over to make the binding. She signed and dated it 1991. ← Letter H News! New Classes and a great sale!